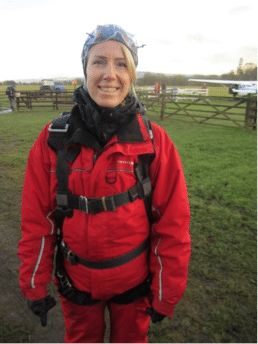 We don’t need you to jump out of a plane for us, but that’s what Jenny did and raised £1,500. And Jo decided to run a half marathon because, as she puts it, ‘They befriended me so I am befriending them back’.Whatever you do for us, and whatever you raise, whether it’s £5 or £50, we are thankful for every last penny. Do get in touch if you’d like to discuss your fundraising ideas. Or simply link your fundraising to our JustGiving page. Don’t forget to share a snap with us on social media so we can get behind your efforts. Befriender, Jenny, smiles (we think!) for Ecas after her parachute jump.